Based On Our Quality Of Work And The Trust We Leave Behind. 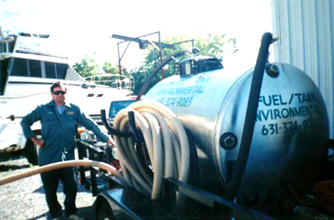 ​Fuel Tank Environmental Provides the following fuel tank services, including tank cleaning service in Long Island, and the NY Tri-State Area. The largest problem we encounter on a Diesel Powered Boat, Home Heating and Back-up Generators is Water Contamination on long-term Storage. Keeping diesel fuel stored for many months, creates problems to the bottom of the tank and if fuel is left for more than one year could cause algae growth, sludge and waterbuild-up. Premature clogged fuel filters and clogged water separators is a sign of contamination or Bad Fuel which will lead to poor performance and engine shut down. Copyright 2013: Fuel Tank Marine & Residential Services | Long Island tank cleaning service | All rights reserved. ​Contamination of BAD DIESEL FUEL causes algae growth, water build-up, sludge, clog your filters and shuts your engine down. We offer quality sludge removal in New York. And Experience Within The Boating Industry He Will Troubleshoot All Your Problems. Saving you Money and More Time Boating! Due to Hurricane Sandy homes in the northeast have been severely damaged by flood waters. Oil tanks related to home heating systems have been contaminated by salt water. Fuel Tank Environmental is providing services to remove waste water from these tanks. Before starting a NEW boiler system the oil tanks should be serviced by a vacuum tank cleaning system. This process removes water and sludge to ensure a smother start up to your new heating equipment.